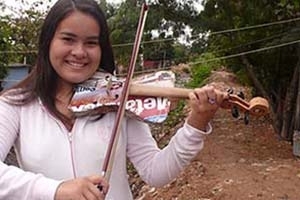 Maria, one of the members of the Recycled Orchestra of Cateura, holding her violin made of recycled trash. SOC Alum Brad Allgood is earning national recognition for his latest documentary, Landfill Harmonic. The film follows the Recycled Orchestra of Cateura, a group of children who live in a slum in Paraguay, next to one of South America’s largest landfills. The group plays music from instruments made entirely out of recycled garbage by community members. Landfill Harmonic is a testament to the transformative power of music and the resilience of the human spirit. The documentary has been featured on programs such as CNN, NPR, and Live with Kelly & Michael. It has screened at dozens of festivals, and won multiple awards, and most recently won Best Documentary at the Humanitas awards. Allgood received his Master’s degree in Film and Video Production from American. He is the Director, Editor, and Director of Photography of Landfill Harmonic.